Grow beautiful, edible flowers indoors with this charmingly packaged kit. Here's the dirt on windowsill gardening: All you need is this mason jar kit, a little water, and a sunny spot to grow perfect pansies, zinnias, chamomile or English daisies without soil. The charmingly packaged kit lets you grow beautiful, edible blooms indoors year-round with no replanting and minimal maintenance. The reusable, vintage-inspired lavender jar is equipped with a passive hydroponic "wicking" system, which brings water and nutrients up to the plant's roots and protects your flowers from over or under-watering. It's a great, green gift for aspiring gardeners, home chefs, and apartment dwellers. Designed by Sarah Burrows and Nick Behr; assembled in Illinois. See what your full grown, blossoming pansies, zinnias or English daisies will look like here. Includes certified non-GMO pansy, zinnia, or chamomile seeds. Easy instructions. I think this would also make a great gift! I will buy again & again!! I will definitely buy from them again!! Never grew. Frustrating. Not at all like the pictures. I do not recommend this product. It is a lovely idea and I was looking forward to having beautiful flowers on my windowsill. I spent $60 to buy all three and honestly got nothing from it at all despite following the instructions. I would have been better off spending $5 on seeds and planting them in a pot. We're still waiting to see how well the pansies grow, but the jar is attractive and fits on the windowsill. It was easy to set up and had quick emergence which is important for satisfaction that you really are growing flowers. 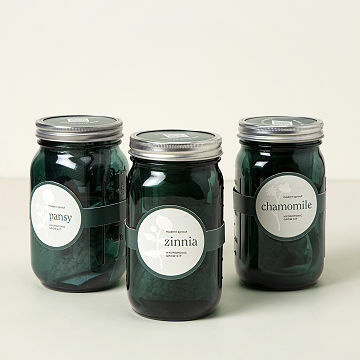 The jars are so pretty! They haven't planted them yet, but they are beautiful jars and much bigger than they looked in the picture. Great for small apartment living. A beautiful way to make urban living more green. A bit of summertime growing in your kitchen window! This kit makes it so easy.